Edward Gale moved to Ranmore Common from Abinger in 1892 when his father became the Denbies Estate’s wheelwright. The Gales lived for many years in the remote Lonesome Cottage at the western end of the Common. One of Edward’s brothers was a shepherd on the Estate. The middle son of Charles Frederick Gale and his wife Henrietta, Edward was born 31st October 1884 and baptised in St James Abinger on 8th February 1885. The Gales moved to Ranmore in 1892; their three young boys were enrolled in St Barnabas School, the two elder ones, George “10 years and 2 months” and Edward “7 years and 10 months” on 29th August, and Charles the youngest on 9th October. The older two had been at school in Abinger, but it was the little one’s first school. 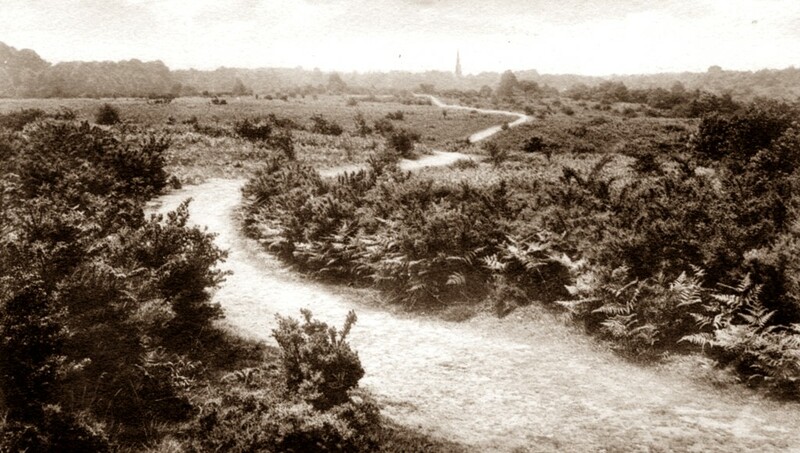 The photograph below of the distant spire of St Barnabas Church showing faintly on the horizon was taken from the western end of the Common near to Lonesome Cottage. It demonstrates how far the young children had to walk each day (about a mile) to attend the School which was next door to the Church. The school logbook tells us that in January 1893 “the Gales ( a family of three) were absent through another case of measles”; in February 1894 the three Gale boys were “absent because of a case of chicken pox”. Edward Gale gained a religious knowledge certificate in 1896 after the annual Diocesan Inspection and, when he “left to go to work” on 5th November 1898, he had achieved Standard III. 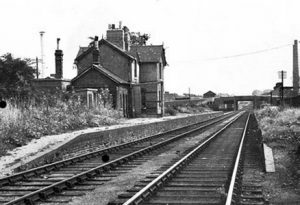 By 1901 he is an agricultural labourer, no doubt on one of the Estate’s farms, but on 18th January 1904, aged 19, he changed jobs and left Ranmore’s rural tranquillity for the greater excitement of working on the railway. Lord Ashcombe recommended Edward to the London Brighton and South Coast Railway, and he started at Wallington Station as a porter, earning 16 shillings a week. Three years later, on 21st January 1907 he was promoted to goods porter at Merton Abbey Station and his weekly wages were raised by a princely 2 shillings to 18 shillings. Merton Abbey Station, long demolished, was built over the site of the old Merton Priory (never an Abbey). The station was very close to the Merton Print Works set up in 1881 by the famous designer William Morris, who went there by train, probably to that station. 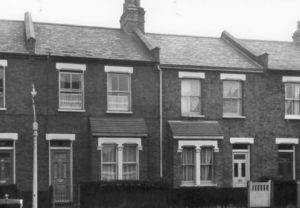 In 1911 Edward Gale is lodging with a stove fitter’s family in 19 Dane Road, Merton, across the road from the station. Also boarding was another porter: Henry Frank Barnes, born Streatham (probably unconnected with the casualty Benjamin Barnes). On 8th June 1911 Edward transferred from Merton Abbey to Horsham Station as a shunter at a guinea a week (£1 1 shilling), but he did not stay there long, resigning 13th October the same year. One can only speculate as to the reason: did the work not suit him, or he the work; or was he too far away from his girlfriend Mary Elizabeth Biggs? 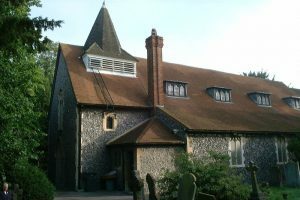 Mary and Edward, both aged 28, were married on 26th April 1913 at the church of St Mary’s Merton. Edward, still at 19 Dane Road, was working as a labourer; Mary Elizabeth’s address was 72 Nelson Grove Road. 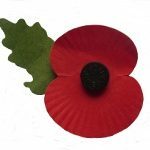 Mary Elizabeth was born in Wimbledon (No 3 Victory Road) on 18th November 1884 to Frederick William and (Sarah) Annie Biggs. She was baptised on 1st February 1885 at St Mary’s Merton. She had several siblings, at least one being born in Farnham, Surrey (her mother’s birthplace). In 1901 Mary was a kitchenmaid in North Wimbledon, part of an extensive household belonging to a widow living on her own means, with a son who was a “black-and-white artist”. Ten years later in 1911, Mary Elizabeth was in Balham, working (no doubt very hard) as a general servant (the only one) to a retired bank clerk born Madras, India and his wife born in Java. 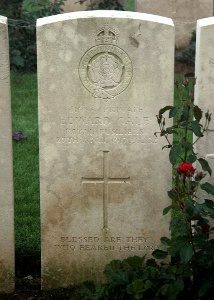 Edward and Mary Elizabeth Gale appear to have had only the one child, a daughter Gladys M(ary?) born in Croydon district in 1916. On 11th December 1915, a few months before his daughter’s birth, Edward joined up at Merton. His regimental career is somewhat confusing, more so because his service records have not survived, but the Surrey Recruitment Registers detail his original enlistment in the 27th Battalion, Middlesex Regiment. He was 5 feet 4 inches tall, 130 lbs, labourer, of 86 Nelson Grove Road, Merton. 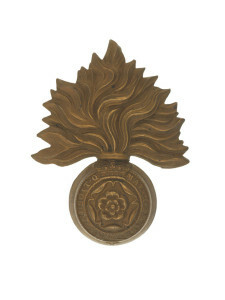 He presumably stayed in the Middlesex Regiment until November 1916: the Medal Rolls for his British War and Victory Medals state that from 4th to 15th November 1916 he was Private No 14727 in the 8th Queen’s (Royal West Surrey Regiment), but after that he became Private No 61055 of the 7th Royal Fusiliers. Edward Gale died of wounds on 27th April 1917, probably in the 42th or 30th Casualty Clearing Station in Aubigny-en-Artoise, a village approximately 15 kilometres north-west of Arras. 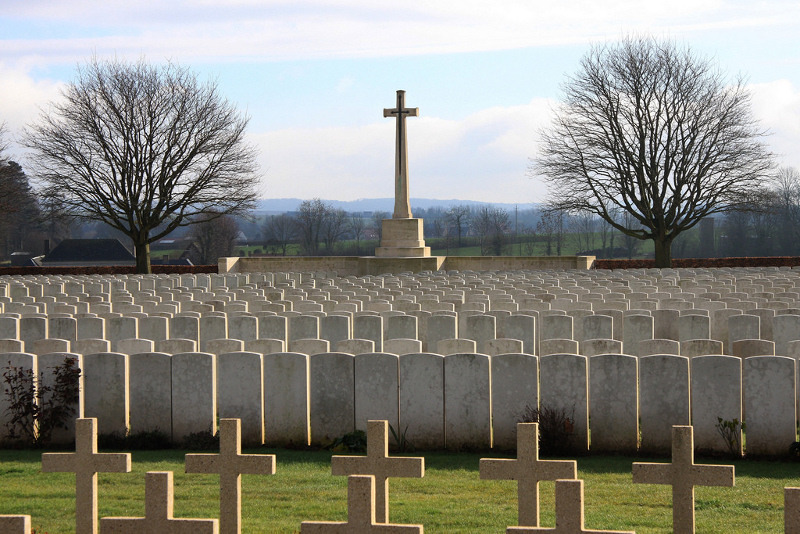 With 2770 others of the Commonwealth forces he was buried in Aubigny Communal Cemetery Extension. His grave lies near the middle of a row, four rows back from and to the left of the Great Cross. Censuses 1891, 1901, 1911, The National Archives (TNA).